Beautiful tablecloth although a little thin. Washed up nicely but required ironing. The subtle grey is very attractive and rich looking. Would not recommend for everyday use. Bring good taste to your dining table with this Bohemia tablecloth. 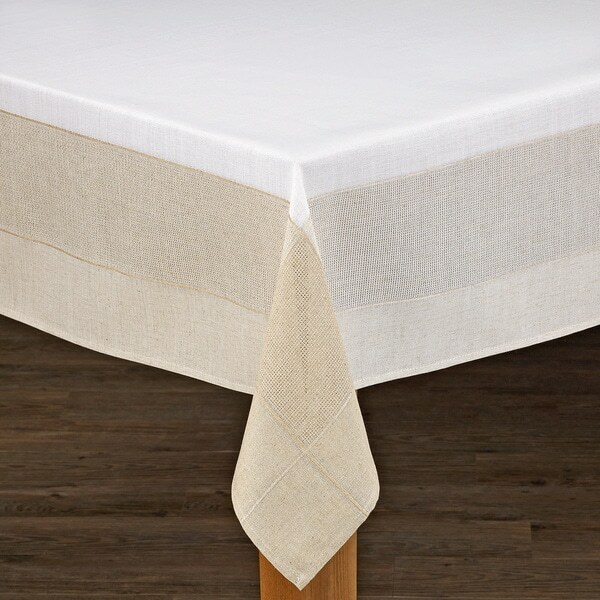 Made with a durable polyester, this tablecloth has the look of linen that delights your dinner guests. Great look, nice fabric. Needs to be about 4” wider to fit my table perfectly. My accents are grey in my diningroom. The material is thick and lays nice on the table. Of course, the first day it got christened by my family. I hope it washes as good as it looks. I’ll keep ya posted. Love using this when we have guests over for dinner out on the patio! This looks beautiful in my dining room, I got the ivory and love it! Could be used in a formal dining room or more casual setting. Very pretty on my table! Good quality. This Tablecloth was a gift. The recipient loved it, especially how easily it washes and drys---definitely no need to iron! Great buy! Really nice tablecloth. Exactly the neutral color and design I needed to accompany my Thanksgiving decorations and table settings. It was packaged nicely as well. Beautiful table cloth. Substantial fabric with good drape. Subtle colors. Definitely will be an asset to my thanksgiving table. Wrinkled up and it won't iron out. I washed it first,then half dried and then ironed,not user friendly! Love it! Looks perfect and the fit is really nice. Washes up well and doesn't need ironing. Good quality cloth, the colors look better in person than in pic! This is a hard to find size. Looked great online. Love the dual color/border and linen look with washability. "What are the dimensions on this cloth. Never saw an ad for a tablecloth that didn't tell you what size it is."